Chicken soup is just good for the soul. 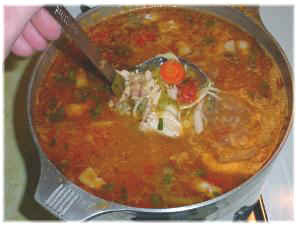 Our good friend from Houma, LA, Mr. Clyde, introduced us to this Chicken Soup Recipe years ago. This recipe will yield about 3 gallons of soup. If this Chicken Soup doesn't get you better when you've got a cold at least your taste buds will feel better. Boil the hen with the bay leaves until the meat just begins to break away from the bone (this could take 3 hours using a hen). Save the liquid. De-bone the hen chopping the large pieces into 1" cubes. Strain the liquid if the bones have come apart. Pick the bay leaves out if you want (don't eat them). In the hen liquid (stock) add all Phase I ingredients. Boil for 15 minutes. Add all Phase II ingredients, boil for 30 minutes. Add all Phase III ingredients and de-boned hen. Bring to a boil then reduce the fire and simmer for 30 or more minutes. Don't boil rapidly again or the chicken will break into shreds. Use a fryer or two if you like, they'll cook faster and be "almost" as good. Be careful not to boil the hen at the beginning for too long. If you do the meat will break into shreds. The longer this sits after it's done the better it will be. Freeze the remainder in quart bags for future enjoyment. Don't hesitate to add other vegetables if you have them such as turnips and mustard greens.